Removing the bur and rounding the edge solves the issues mentioned above with added benefits. If you are doing paint or powder the radius on the edge helps avoid the coating being thin or the normal failures in the area. It also gives a good"key" for bonding with out a pattern to show through. If the parts are being welded it saves time in hand prepping the edges to get the added surface area for a good weld. In bending you can also see creasing or cracking if there is a line pattern to the part. A non directional finish tends to solve the vast majority but using a DA or palm sander eats up far too much time and labor. The typical wide belt sander will leave that line pattern as that is just what sanding belts do. Getting away from that is possible and rather simple to do. You are not limited to belts any more and have far more options to deal with bur removal. Abrasive belts leave the lines on the parts but also do very little if any thing to remove a bur. More than any thing they tend to push the bur over but not remove it. That is what creates the "knife edge" we have all cut ourselves on when handling parts from a belt sander. You need a brush step to sweep away the bur from the edge and round that edge over. A normal non woven style abrasive like Scotch brite will work but it tends to wear away quickly. Going to a combination or flap style brush helps resolve this. 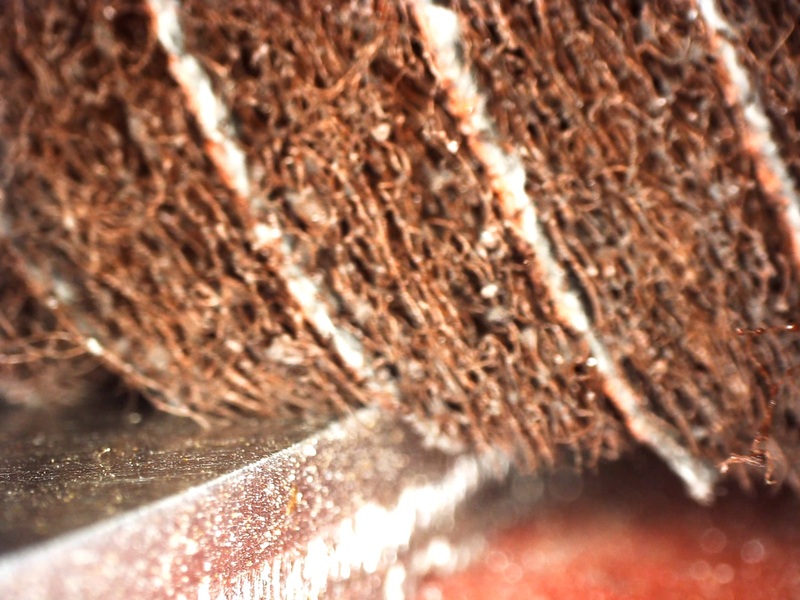 The abrasive not only removes bur but helps to support the non woven material and avoid breakage extending its life. In the picture below you will see a close shot of the combination brush Loewer uses for this task. As you can see in the brush picture, there is a fair bit of edge wrap with this brush. That action of wrapping over the edge of the part is what removes the bur and rounds the edge. This also leaves behind a non directional finish to avoid showing through coatings or causing cracking when bent. You end up with parts that are much safer to handle and look better when coated. It requires thinking a bit outside the box and moving away from the typical belt sander. There are other benefits like a vastly reduced power consumption that lead to a long term savings as well as the short term gains seen instantly. Machines made by Loewer in Germany use these ideas and abrasives. 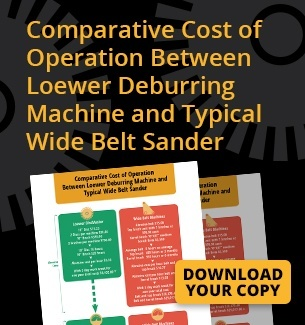 You get the cost savings and better parts in a machine that is simple to operate and live with long term.